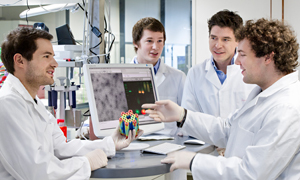 A main focus of the research lies in the atomically controlled production of both macroscopic and nanoscopic materials. Large-scale, perfectly homogeneous crystals can be prepared by a melt process. Thin-film materials can be deposited atomic layer by atomic layer on very homogeneous crystalline substrates in ultrahigh vacuum using molecular beam epitaxy. Left: Simulation of propagating spin waves in a nanostructure magnetic film (blue - 18 nm thick Ni80Fe20, white - periodic lattice of holes with 160 nm spacing and 60 nm edge length). Middle: A silicon germanium single-electron transistor with metallic surface gates. Right: Heteroepitaxial multilayer structure of transition metal oxides for the realization of magnetic tunnel junctions. Organic, soft, and hybrid material systems in layer structures are often prepared by simple spin rotation of liquids. All these methods exploit the spatial self-organized rearrange of atoms in the materials. Complementary to this, the spatial extent of the materials can be reduced or more accurately defined using nanolithography methods, for example, by etching down to a few nanometers. The atomic control of materials is an important prerequisite to be able to design efficiently the conversion and storage of various energy excitations. This applies likewise to the conversion of solar and thermal energy in electronic form as well as to electrochemical energy conversion and storage, photodiodes and photodetectors, sensors, and electronic and magnetic circuits. Solar cell constructed from polymers, dyes and titanium oxide. The functionality is determined primarily by the interfaces between different materials. The smaller the structure, the more the properties of the surface and boundary atoms and quantum mechanical phenomena dominate. In nanoscale materials with only a few hundred atoms, novel optical, electronic, catalytic, and magnetic properties can emerge, which differ significantly from the properties of the bulk materials. In very small structures, the dimensionality of the electron states can be three, two, one, or zero, depending on how many momentum degrees of freedom the electrons have. The dimensionality of the electron states has a very large influence on the physical properties of the material. 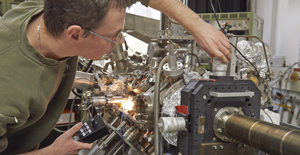 In the research labs of the Physics Department of TUM, the quantum states of individual electrons, spins, and photons are controlled and manipulated with the potential to be used in quantum information technology applications. At the same time, fascinating macroscopic physical phenomena arise when many such states are quantum mechanically correlated.